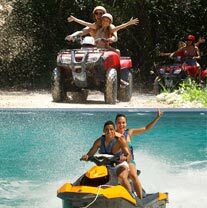 ATV Tours are one of the most popular activities in Playa del Carmen. The Playa del Carmen area is home to vast expanses of Mayan jungle, miles of virgin white sand beaches, and of course awesome jungle trails. There are a lot of ATV tours in Playa del Carmen because there is just so much area to ride. We offer the best prices and best selection on Playa del Carmen ATV tours in town! 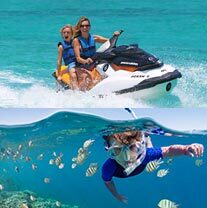 BEST PRICES ON ALL PLAYA DEL CARMEN ATV TOURS! Q: Which one is closest to my hotel? A: See our handy ATV Tour Map to get an idea where the ATV Tours are located in relation to your hotel. Q: I'm on a cruise ship - can I do your ATV Tours? A: Yes. All of our ATV tours are open to cruise passengers, as long as the tour's schedule works with your cruise schedule, but the closest ones will be ATV Jungle Explorer and Jungle Jim's ATV Tour. For Cozumel cruise passengers, the tours will pick you up near the ferry pier in downtown Playa del Carmen. Q: What is the minimum age to drive? A: This varies depending on the tour. Please refer to the tour detail pages for this information. If you're under 16 and want to drive, you'll want the ATV Explorer. Q: What happens if it rains on the day of my tour? A: All tours run rain or shine. In the tropics, it can rain a little bit every day - however, when it's 90 degrees the warm tropical rain feels very good. Plus, the rain rarely lasts for more than 20 minutes at a time - full day rain is almost nonexistent. Of course, if the weather is really bad due to a storm, your tour will be cancelled and you'll have a chance to reschedule or get a full refund (your choice). Q: Are the ATVs Automatics? A: ATVs are split between semi-automatic and fully automatic, depending on the tour you choose. However, even semi-automatic shifting is very easy - even for beginners. TAKE A RIDE ON THE WILD SIDE WITH OUR ATV TOURS!